In my dreams, I kept seeing a symbol. A symbol of peace. A healing symbol that I could share with kindred spirits around the world. My dreams were compelling me to design the future peace symbol Suddenly this South Beach artist became Alice entering the magical world of the spirit. And so, The Healingstar of Peace was born on an airplane within seconds of seeing the diagram of the Tree of Life. I quickly sketched the first draft on a napkin. It came alive. I excitedly folded the napkin in half ,held it up to the bright light of the sun streaming through the window. The divine symmetry appeared. At the center sat the traditional peace sign surrounded by interfaith symbols every facet was revealed the puzzle was solved. The stones adorning its points would emanate the healing energies found in sacred ancient texts. The Healingstar of Peace draws its energy from the Kabbalistic model of the universe called the Tree of Life ~ the blueprint of the cosmos on a microcosmic and macrocosmic level. 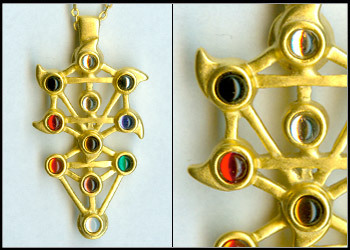 It is the Tree of Life in three dimensions, folded to become an amulet accessible to all . Lofty as it may sound, I bring you The Healingstar of Peace directly from the ethers. It was given to me by God, and I in turn give it to you. Wear it around your neck, hang it in your garden window, give it to a friend or loved one in need of healing. However you claim the Star, it promises to bring an extraordinary element of beauty into your life. I wish only good things for you on your journey. May we all be part of the increasing circle of peace. 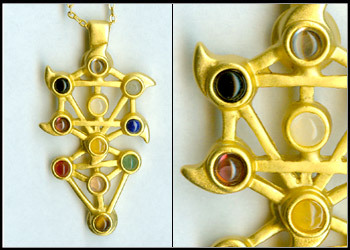 This piece when open transforms into the Kabbalistic Tree of Life. The Healingstar of Peace was inspired by the Kabbalistic model of the universe known as the Tree of Life. 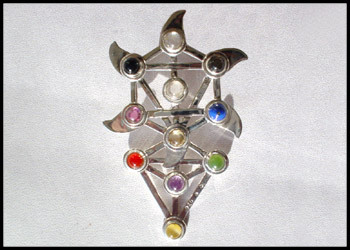 Each gem stone symbolizes one of the ten sephirot or divine emanations . 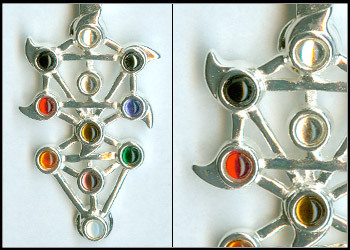 The center stone represents the Da’at ,the unifying element that holds the key to all the “chambers”. embossed with the " Healingstar of Peace" logo in silver. with 13 Swarovski Crystals on front and back. Necklace: The Star is suspended from a delicate link chain. Size: 30 mm /1 1/8"
with 13 Semi-Precious Gemstones on front and back. 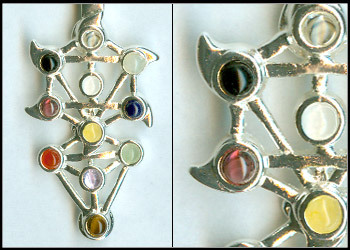 Front: Quartz, Labradorite, Lapis Lazuli, Yellow Jade, Garnet, Black Onyx. Back: Tiger Eye, Jade, Carnelian, Amethyst and Quartz. Necklace: The Star is suspended from a delicate link chain.. Size: 49 mm / 1 15/16"